Sinead joined the Clinical Negligence Team in June 2017 having qualified as a Solicitor in 2016 at a leading London law firm, where she gained considerable experience in Clinical Negligence. Sinead graduated in 2010 with a LLB Hons degree before going on to complete a Masters in Medical Law and Ethics at The University of Manchester. Upon completion of her Masters Sinead commenced the Legal Practice Course at The College of Law, Bloomsbury whilst working as a legal assistant at a law firm in Lincolns Inn. 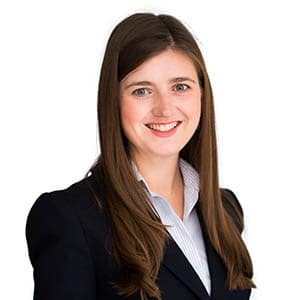 Sinead graduated from The College of Law in 2012 and went on to complete her Training Contract within a dual Medical Negligence/Personal Injury department at a Leading London law firm before qualifying as a solicitor in March 2016. In her spare time Sinead enjoys walking, particularly in the mountainous Lake and Peak District, traveling and going to the Theatre. Sinead advises and represents individuals who have been injured in the course of their medical treatment. In addition to managing her own case load Sinead also works very closely with experienced partner Richard Coleman on a number complex cases involving injuries of maximum severity such as birth injuries, cerebral palsy claims, fatal accident claims and bariatric (weight loss) claims. Sinead has a particular interest in fatal accident claims, bariatric, spinal and birth injury claims.